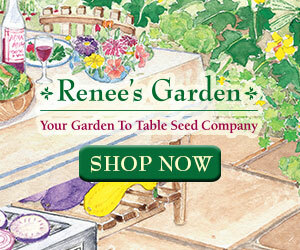 Being a frugal gardener, I don't have the money to shell out on upwards of $200 plant stands with grow lights. I have a window with a decent amount of afternoon light, but the seedlings do tend to get leggy as they strain for the sun. Today, I put together a system using a shelf I already had and a light that cost me only $17. 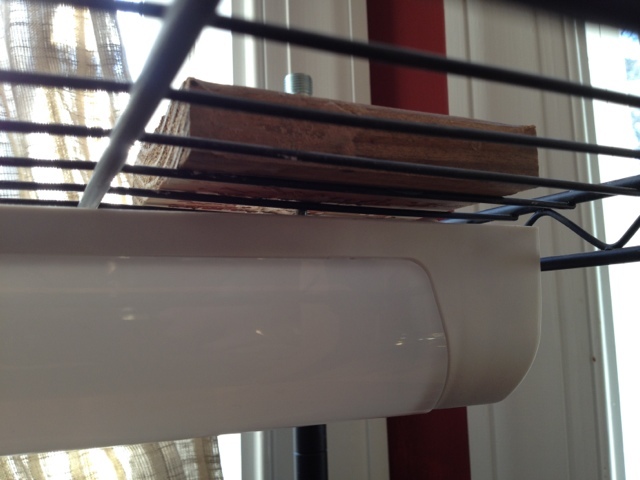 The shelf was from Target, and originally cost me another $17. So the total cost was $34. 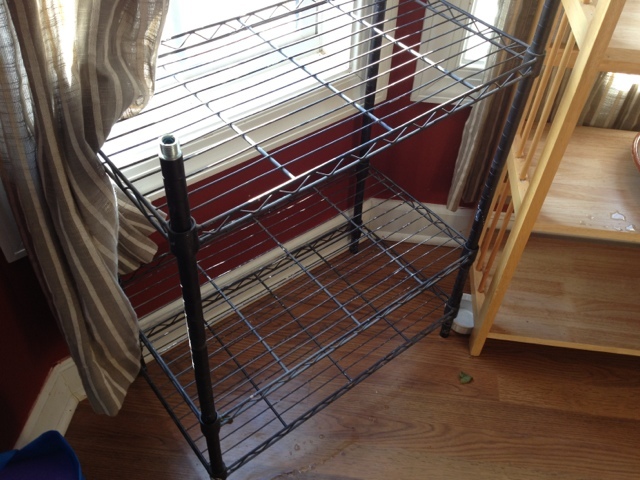 I started with this three-shelf mini metal shelving from Target. They are currently on sale for $15.99, so I may replace the one I stole from my pottery studio. I like that the shelves are not solid and will allow light to filter through to all levels. 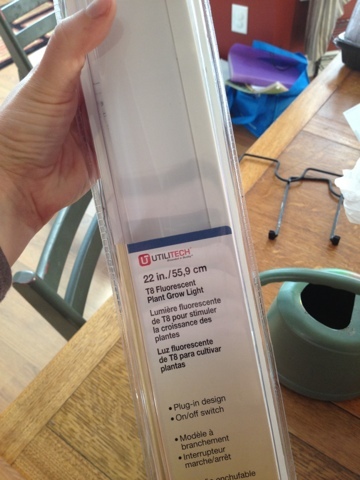 I purchased a 22" Utilitech T8 Fluorescent Plant Grow Light Lowes for about $17. I don't know the quality of this bulb and fixture, but I like that it was light weight and would be easy to take down for summer and fall storage. 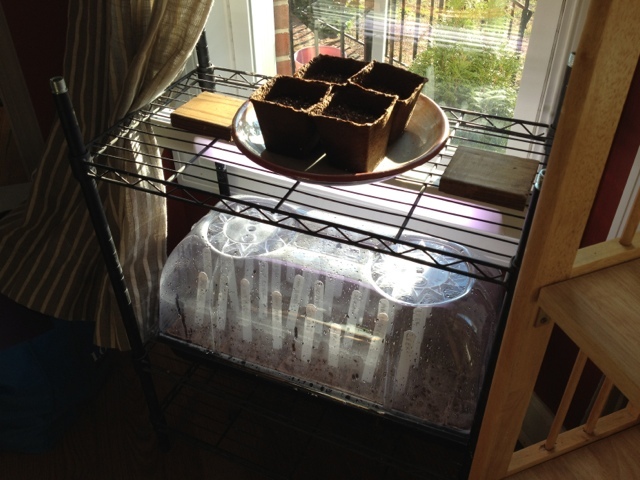 I adjusted the middle shelf on the stand so that is was only a couple inches above the bottom one in order to leave plenty of room for the light and the domed mini green house without having the light right on top of the seedlings. 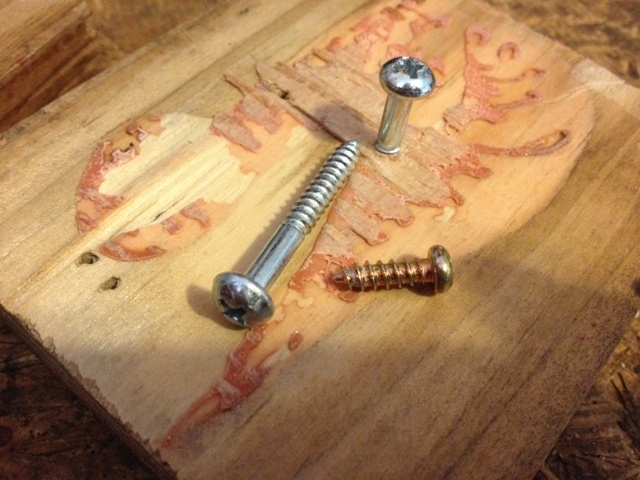 I then found two scrap wood blocks on Joe's work bench and screwed in the 1/2" screws. 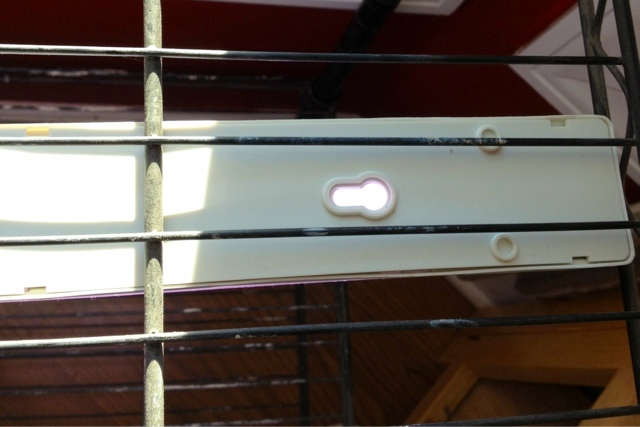 These were too short to reach through the metal bars, so I replaced them with 1 1/2" screws. I then positioned the light where I wanted it to hand under the center of the top shelf and slid the screws into the mount hey holes. Having the mounts on two individual blocks of wood rather than one board made the installation incredibly easy. If just the right amount of screw is left exposed for the mount, then you don't have to worry about the block accidentally sliding off. The finished product is nothing fancy, but it leaves room on the top shelf for more seedlings and a small storage area on the bottom. In the future if I decide it needs more light, for $17 more, I can add another light fixture and even add another shelf on top to make room for more seedling trays. For now, this is all I need. What a great idea to mount on blocks --duh! I've been trying to figure out how to mount a light on my little greenhouse shelf thingy that sits in the screen porch. Looks like an inexpensive solution to the low light challenge.